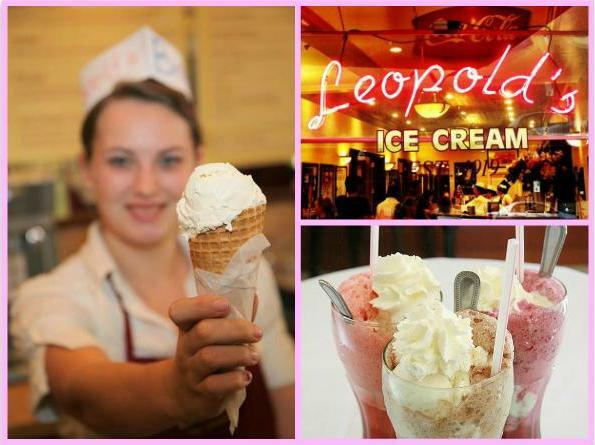 Leopold’s Ice Cream in Savannah, Georgia, has a long history of being a local favorite. The first store opened in 1919 in downtown Savannah, right on the intersection of two of the city’s metro lines. Brothers George, Peter, and Basil Leopold opened the store after immigrating to the United States from Greece. The shop’s hometown hospitality and quality ice cream kept the business successful for 50 years. However, in 1969, Peter Leopold’s youngest son, Stratton, decided to step away from the family business and pursue a career in Hollywood. After many years as a Hollywood producer, Stratton later returned to Savannah with the intention of reopening Leopold’s, and brought with him Academy Award nominated designer Dan Lomino. The two redesigned the shop at a new location with many of its original fixtures: the soda fountain, sundae holders, interior wooden phone booth, Philco radio, along with other pieces. Additionally, Stratton covered the walls with Hollywood memorabilia, adding many props, posters, and signed photographs of actors who have worked with both Stratton and Lomino. Leopold’s officially reopened in the summer of 2004, roughly 85 years after the first Leopold’s came to Savannah. 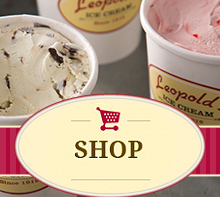 Leopold’s Ice Cream doesn’t just have a rich history; the ice cream itself is reason enough to love the shop. Standard flavors include Honey Almond and Cream, Chocolate Raspberry Swirl, Lemon Custard, and a local legend, Tutti Fruity. Seasonal flavors become even more creative—and even more appetizing—and include Banana, Rose Petal, Lavender, Peach, Japanese Cherry Blossom, Guinness, and Huckleberry Cheescake. All flavors are made at the store, one batch at a time, with no artificial ingredients or dyes, with the same family recipes used by the original Leopold brothers. In other words, everything is made just as it was in 1919. « Leopold’s Ice Cream Celebrates 95 Years of Tasty Memories!